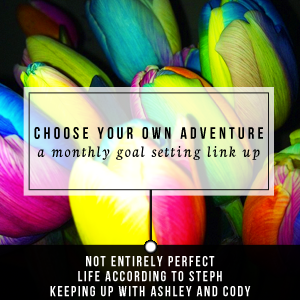 We're already back for another Choose Your Own Adventure link up, crazy!! It seems like last week was just the beginning of December. Looking back at my simply goals from last month I actually ended up doing really well with the goals. Yes, I'm somewhat surprised at that, not going to lie I actually made them last month and pretty much forgot about them. I didn't really get to organizing my Pampered Chef business but I accomplished the other two goals. I put more than seven items into my garage sale/to get rid of pile and I've got over a dozen blog post ideas for each of the topics I write about. I haven't marked them out for each day yet but it helps just having sorted lists of topics. Even though I didn't organize my Pampered Chef papers I did end up pulling together all my scrapbook stuff and really organizing all of that stuff. Somehow the packs of stickers ended up all over the condo, along with sheets of scrapbook paper in four different spots. It's nice to have everything in one spot so I can actually use the pretty paper and fun stickers I purchased. January is all about complete. Finish up that project you've been meaning to do for forever! 1. Put the condo up for sale. Earn Up to 1,800 SB with Audible!